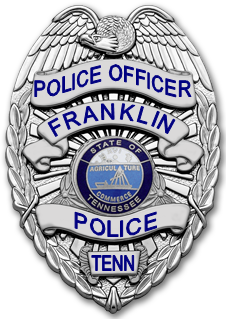 At 2:30pm, Friday, June 24, Chief Deborah Faulkner will personally present Franklin Police badges to the Department’s newest officers: Officer Cary Bradbury, Officer Ryan Dugger, Officer Tamela McNeal-Hampton, Officer Chris Hollingsworth, Officer Joshua Hooten, Officer Clinton Riggs, Officer John Toman, Officer John Phillip Tuck, and Officer Tyler Wiggers. The formal ceremony is being held at Rolling Hills Community Church, 1810 Columbia Avenue. The public is invited to attend this one-hour ceremony, as we celebrate the certification of these nine officers to serve as Tennessee police officers, and welcome them as they join us in service to our community.